Snow was falling thinly in the gathering darkness on a chilly evening of early winter in the year 1716, when a traveller, who rode a great black horse, drew up before a small village inn on the highway which leads from St. Petersburg (Petrograd) to Moscow. Dismounting with a sigh of relief, he shook himself like a dog when it leaps from a pool, to get rid of the sheets of snow that enveloped his shoulders and neck. He was a nimble man of medium stature and muscular build, with kindly brown eyes that relieved the stern lines of face; icicles clung to his pointed black beard, and his eyebrows were white with rime. "Welcome home again, Petrushka Petrovitch!" exclaimed the stout and jovial innkeeper who greeted him pleasantly at the doorway. "What a stranger you are! It is good to see you once more in your native village, where the memory of your saintly father, the priest, is still held in reverence." traveller answered quietly. A groom came forward to lead his panting horse to the stables, and the traveller entered the inn stamping his feet, which were benumbed with cold. "Whence come you, Petrushka?" asked the innkeeper, whose small grey eyes twinkled with good humour. "The great new city with the half-foreign name! Travellers tell me that 'burg' is the German word for 'gorod'." Petrushka threw off his fur coat. "I need food and drink," he said, "and would sleep here to-night." "My daughter Sonya will feed you well. Sit down beside the stove. You are half-frozen. . . . Ah! you are a fortunate man, Petrushka. You have acquired much learning. You have also seen St. Petersburg. I hear the new capital is the most wonderful city in the world. Some day I must pay it a visit." Petrushka smiled. "You have grown stouter, my friend," he said. "Hard travelling in this weather would reduce your weight." "Tell me something of which I have no knowledge," laughed the innkeeper. "Tell me about St. Petersburg. They say it grows like a mushroom." "The streets are now lit with lamps each night, just like Paris. What do you think of that, Aleksyey Nikolaevitch?" "Wonderful! wonderful! It must be a sight indeed. But on stormy nights the lamps will all be blown out." "Lanterns protect them, and they burn well in all weathers. You have no idea how cheerful they look. Withal, they are a great convenience. One can move about the streets now as safely by night as by day." "Nor have any fear of thieves, eh?" "None whatever. Besides, the new Imperial police officers are everywhere--hundreds of them." "There is one here, Petrushka--in your own peaceable native village. Think of that! He stalks about as if he were the Tsar himself. When he enters my inn, you might think it belonged to him. But do not let us speak about him. The thought of the fellow makes my gorge rise. What about the Tsar himself? Have you seen him of late?" "His face is as familiar to me as is your own. One meets him everywhere in St. Petersburg. . . . But what delays Sonya? Has she forgotten me? I am as hungry as a wolf, my friend." "Sonya, Sonya," called the innkeeper, "have you fallen asleep?" "I am coming, father," the girl made answer pleasantly as she bustled into the room, carrying a steaming bowl of soup and a loaf of bread which she set down on a table. Petrushka at once began to partake heartily of the first meal he had had since early morning. "I have been told," the innkeeper said from beside the stove, "that the Tsar has been given new titles by the Senate. He is now called 'Peter the Great'. A Tsar who has built a great new city which bears his own name is worthy indeed of being called 'Great'." "He has also been declared 'Emperor of all Russia' and 'Father of his country'," added Petrushka over his soup. "There has never been such a Tsar," the inn-keeper went on. "Still, although he is called 'Father of his country', many think he inclines too much to favour foreigners and to imitate foreign manners and customs. Most of his great officials are foreigners. . . . Are you still in the service of the foreign general, Petrushka? I cannot remember his curious name." "General Gordon," Petrushka reminded him. "Yes, yes, Gordon--a name that trips on one's tongue! No doubt he has good cause to be loyal to Tsar Peter. He has grown wealthy in Russia. No doubt he loves Russia much better now than his native land." Sonya entered with a plate of meat, which Petrushka proceeded to devour with relish. "Where is General Gordon at present?" asked the innkeeper. you in secret regarding him--the something which brings me here this evening." The innkeeper closed the door. "Come and sit beside me," Petrushka said. Aleksyey dearly loved a secret, and smiled expectantly as he drew in a chair, sat down, placed his elbows on the table, and propped his chin on his folded hands. "General Gordon," Petrushka explained, "has long desired to return to his native land." "Where is that land? What name does it bear?" "It is a great island in the west. One part is called Scotland and the other part is called England." "An island with two names. How strange!" "The Tsar has forbidden my master to leave Russia, and he remains in the royal service much against his will." "You astonish me! Ah! this is news indeed." "The General would have returned home long since had he but himself to consider. It is not difficult for any man to escape from Russia. But he has a wife and a family. He cannot go away and leave them behind. The Tsar would thrust them in prison so as to compel him to return." "Peter is a hard taskmaster. I have heard that said of him." "Listen to me, Aleksyey Nikolaevitch. You are my kinsman and I need your aid. Promise to help me in the task I have undertaken. You will be well rewarded, I assure you." The innkeeper's eyes sparkled with satisfaction. He loved a secret, as has been said, but what he loved most of all was money. He seemed to hear the clinking of gold in Petrushka's voice. "If it is safe to help you, I shall help you, my friend," he said, rubbing his hands together glee-fully. "The General, as I told you," Petrushka went on, "is at present in Poland. He has no desire to return to Russia. If his wife can leave Moscow with her three daughters and join him in Poland, my master will proceed to Dantzig and take ship to his native land." "I cannot see how I can help you in this matter, Petrushka," exclaimed the innkeeper, with a ring of disappointment in his voice. "Moscow lies many versts distant from here, as you well know." "Be patient and listen," Petrushka said. "You probably do not know that one of the General's daughters is at present residing in your neighbourhood. She is the guest of Colonel Maykov's wife. I wish you to send Sonya to bring her here to me to-morrow morning. For this service I will pay you two golden roubles." The innkeeper pondered for a moment. Then he said: "What if I get into trouble with the police over the matter? How can I rid myself of blame if I am asked awkward questions?" His face wrinkled with anxiety. come here, so that I may hand her an important package," explained Petrushka. "What do you intend to do after she comes here?" "Ask no more questions, Aleksyey Nikolaevitch, for the less you know the less you will have to answer for. All you need ever say is that I came here as a traveller, and gave you a letter to deliver to General Gordon's daughter." The innkeeper nodded his head, but made no response. His lips were pursed and hard. "Must I go myself?" Petrushka asked impatiently. "Are two golden roubles as naught to you?" "Say four roubles, and perhaps I may take the risk"
"Well, I'll say three," Petrushka answered. He rose to his feet, having finished his meal. "If you ask for more, Aleksyey Nikolaevitch, I must go outside and find someone else who is willing to do this service for a few kopecks." "Don't be so impatient, Petrushka. Sit down. You must not leave my house to-night. It is now fully three years since we have met, and I have often longed for your company." "First of all, let this matter be settled," Petrushka insisted. "Will you send Sonya with the letter on payment of three golden roubles?" You are a hard man, but I will not reproach you. Sonya will deliver the letter as you desire." Aleksyey spoke as if he felt he was making the worst of a bargain. The two men shook hands to confirm the agreement. "Now make yourself comfortable, Petrushka," the innkeeper said softly. "Tell me all about your travels and all about the great new city of St. Petersburg. I can't understand why your master wants to live on an island instead of at Tsar Peter's great Court." "I said he was fighting in Poland at present," smiled Petrushka. "But wars don't last for ever. When victories are won, great generals return to the capital to be honoured and made rich by the Tsar." Petrushka shrugged his shoulders. "My master would prefer to fight his own country's battles. There is trouble brewing for the island kingdom in these days." "How much you know, my friend! Living here in a village, I never hear aught of foreign countries. What has gone wrong in this island with two names?" "What of that? The night is young as yet. I am curious to hear why the General desires to leave Russia." "I will tell you as much as I know. . . . You have heard about Spain?" flashing black eyes, and he spoke Russian vilely." "Well, Cardinal Alberoni, prime minister of King Philip of Spain, has been plotting with Baron Goertz, of Sweden, to form a great alliance against the island kingdom. Baron Goertz is endeavouring to bring about a reconciliation between King Charles of Sweden and Tsar Peter, so as to form a great alliance with purpose to overthrow the English king, whose name is George, and bring France under the control of Spain." "Why should Tsar Peter trouble himself about the island ruler?" "Well you may ask. It seems that another prince claims the right to reign over the island kingdom. He has many followers, who are called Jacobites. Some of them, indeed, are in Tsar Peter's service." "And is General Gordon one of these Jacobites?" "No. He owns allegiance to King George. From what I have heard, he desires to return home, being a valiant and accomplished soldier, to take part in the great war if it ever breaks out." "Supposing Tsar Peter supports the rival prince of the island kingdom, your master will then fight against our country, eh?" "It is unlikely the Tsar will interfere in this matter. The islanders have a strong navy. Indeed, they are supreme on the seas. No single Power would dare to oppose them. That is why the Swedes and the Spaniards desire to obtain help from the Tsar." "Let them fight their own battles, say I. Why should Russia help Sweden? Are we not at war with the Swedes at present?" "We are. Tsar Peter has no greater rival than King Charles of Sweden. Baron Goertz, however, is endeavouring to arrange a peace betwixt our country and his own. He proposes that the Tsar should then seize part of Prussia, and that King Charles should take possession of Norway." "How did you come to know all this, Petrushka?" I have heard my master speak of the great conspiracy. He desires to hasten to his native land, so as to warn King George of the peril which threatens him." "It is but natural that he should think first of his own country. May he achieve his purpose, Petrushka! He is a most excellent man. Each time he came here he placed in my hand a golden rouble. Besides, he has been a good master to you, my friend." "I am ready to lay down my life in his service," Petrushka answered. "If it is God's will, I shall accompany him to the island kingdom to strike a blow against the Jacobites, who are his enemies." great new city of St. Petersburg, the streets of which are lit with bright lamps every night." Petrushka smiled, and called for kvass. Then he proceeded to satisfy the innkeeper's curiosity regarding Tsar Peter's great new capital, telling of its wonderful buildings and wide streets, its shops and factories and shipbuilding yards, and of the skilled foreign workmen who were instructing Russians how to build large ships for war and trade. He then related many anecdotes regarding Tsar Peter's visits to foreign countries. "At Saardam, in Holland," Petrushka said, "he went about in disguise, and, assuming the name of Peter Timmerman, hired himself as a workman to a shipbuilder, and lived on the wages he earned in a most wretched hovel." "What folly!" exclaimed the innkeeper. "It was not seemly that a Tsar should live like a peasant." "Tsar Peter desired to learn the art on which he hoped to found Russia's future greatness. Afterwards he went to England, where King William presented him with a beautiful yacht, which I have myself seen. In the island kingdom he worked also in a dockyard until he became skilled in the craft of shipbuilding. Then he applied himself to the study of various trades and manufactures in which the island people have great skill. Ere he returned to Russia he visited Germany and Austria and Italy. No living man has travelled more than Tsar Peter." It was long after midnight before Petrushka had ceased talking, and he and the innkeeper, yawning heavily, bade each other good night and went to bed. Early next forenoon Sonya, who had set out from the inn immediately after breakfast, returned from Colonel Maykov's house, bringing Marya, the General's daughter, with her. The girl was slim and fair-haired, with rosy cheeks and soft blue eyes. "How you have grown, Marya!" Petrushka exclaimed. "It is pleasant to see you once again. I have brought you a birthday present from your father. How old are you now?" "Fourteen years," answered Marya, whose eyes sparkled when Petrushka handed her a package containing an English doll. "You must not open the package until you return to Colonel Maykov's house," Petrushka told her. "How kind of you to bring it to me!" exclaimed the girl. The man smiled and patted her cheeks. Then turning to a groom he said: "Bring my horse from the stable. I must depart at once." [paragraph continues] 'a matter of great importance'. These are the very words she used." "I have to hasten back to St. Petersburg as quickly as possible," Petrushka said. "But I must tarry here a little if Madame Maykov bids. me to visit her. She may have some message which she desires me to carry to her husband. Will I take you back on horseback, Marya? You can sit up behind me on the saddle." "That will be delightful," answered the girl, little suspecting Petrushka's intention, for he had planned to carry her away to the next post station where he could hire a sledge and convey her to Moscow. Having paid his bill to the innkeeper, Petrushka leapt into the saddle, and then leaning over lifted up Marya, who sat behind him clasping her arms about his waist. "I shall bid you farewell when you return," the innkeeper said. "So be it," answered Petrushka with a smile, as, tossing a coin to the groom, he urged his horse onward and rode away. When he had ridden a little over a verst, he reached the roadway leading to Colonel Maykov's house, but turned his horse towards the right. "You are taking the wrong road," Marya said with a laugh. and sisters are to leave at once for Poland to join your father." "But I should first bid good-bye to Madame Maykov," Marya pleaded. "She must not know you are leaving, little girl. I am carrying out your father's orders. We must escape from Russia at once, else your mother and your sisters and you yourself may be thrust into prison." "Hush! I will explain everything later. The post station is only five versts farther on." It was a gloomy cheerless day. As the road opened out from a tree-clad valley lying between low hills, and turned to cross a wide barren plain with frozen marshes, the icy wind confronted them in full blast as if the tempest doors of the north had been suddenly flung open. Soon Marya's teeth began to chatter, and at length she complained, in a broken voice, that she was unable to endure the journey. Petrushka drew rein and slipped down from the saddle. "Be brave, little girl," he said cheerfully. Remember you are a soldier's daughter." He lifted Marya from her uncomfortable seat, intending to make her. walk for a short distance. "Why, your hands are like ice," he exclaimed with concern. "You are not sufficiently clad for this rough journey. It was foolish of me not to think of that sooner. Never mind. I shall wrap you up and you will feel quite comfortable,"
Divesting himself of his fur coat he threw it over the girl's shoulders and knotted the long sleeves in front. "Don't you feel warm now?" he asked. "Oh, yes! You are very kind, Petrushka. But what about yourself?" "I am accustomed to rough it," he laughed as he lifted her into the saddle again. "I think you had better sit in front now. What a big bundle you make just like a birthday doll wrapped up in a skin package!" The girl laughed merrily, and Petrushka mounted his horse again and set it trotting along the highway at a goodly pace. At the post station, which was reached early in the afternoon, Petrushka hired horses and a carriage, being unable to obtain a sledge. Then he took Marya to the inn, and there they both partook of a warm meal. Having purchased a heavy rug, he returned to the post station with the girl, and lifted her into the carriage as soon as the horses had been yoked. "How far distant is the next station?" he asked the driver. "Not more than eight versts, master," was the answer. "But our progress will be slow, I fear. Much snow lies on the roads and the frost has made it hard and slippery in places." "Drive as swiftly as possible," Petrushka urged him. "You will be well rewarded, my friend." The journey was a slow and arduous one. The horses seemed afraid to run fast. They were constantly tripping on the frozen ruts where the snow lay thinnest, and at those parts which were made difficult by piled-up wreaths of soft snow they laboured heavily at a slow pace. It was late in the afternoon when the next post station was reached. Petrushka at once leapt from the carriage and hastened into the office of the Post Commissary. "Have you a sledge for hire?" he asked abruptly. "There is an excellent sledge here," was the answer. "You can have it to-morrow morning." "I shall require it in another hour," Petrushka said, "and also fresh horses. I must hasten on and reach Moscow to-night." "That is impossible," the Post Commissary grunted. "I have only two horses, a brown and a grey, and they were engaged this morning. Would you grudge the animals their natural rest?" "And look at the sky," broke in the driver. "We'll have more snow before very long." "I cannot tarry here," Petrushka declared impatiently. "Do you think I am travelling for pleasure? I will pay double rates for the horses. Let them be well fed before we start." "The road is not only difficult but dangerous," protested the Commissary. "Last night a sledge was chased by wolves not many versts distant from here." "Wolves?" exclaimed the driver, turning pale. Petrushka laughed hoarsely. "I have heard such stories before. Travellers who spend much time at the inns always blame the wolves for their delays. We have no need to fear wolves even if we meet them. I have a hand-gun and two pistols. Wolves are easily scared away by fire-arms. Besides, I shoot well." He drew a purse of gold from his pocket and made the coins jingle. "That is sweet music," smiled the Commissary. "I shall pay you the full value of the horses," Petrushka said in a low voice. "Surely you will hire them now." "Take the child to the inn. Give her hot tea to drink," growled the Commissary. "The horses will be ready in an hour." He turned away and hastened towards the; stables. "Master, what about me?" asked the driver. "I have need of something to drink, too." Petrushka thrust forty kopecks in the man's outstretched hand. "When we reach Moscow," he whispered, "you will receive a gold rouble for serving me so well." The driver grinned. "Do not let the Commissary hear that," he whispered back. "He might talk about it. There are men in this village who are more to be feared than wolves." Petrushka lifted Marya from the carriage and carried her to the inn. The little girl was pale and dispirited, but when she was taken into a warm room and placed beside the stove a flush came to her cheeks and she began to smile. A woman brought her a dish of hot tea, and she sipped it greedily. "Beyond this place the roads are smooth," Petrushka said, "and we shall travel swiftly." "The sledge will fly like a bird, little lady," smiled the woman. "You are sure to fall asleep. I wish I could go to Moscow with you. It is a great and wonderful city." "My mother is in Moscow," Marya said. "How happy she will be when she sees you, little lady!" "And I shall be happy, too." Petrushka rose to leave the inn. "I shall return for you very soon," he told the girl. Then he nodded to the driver and the two men went out together. They found the Commissary in the stables. "The horses have had warm food," he said, "and seem fresh again. But do not drive them too hard. I have placed a small axe in the sledge. You may require it if there are wolves about." "It is hardly necessary," answered Petrushka. "I can trust to my fire-arms." The driver crossed himself. "We are in God's hands," he said. "Still, it would be safer if you waited until morning," remarked a groom. Petrushka hastened towards the inn and returned carrying Marya in his arms. "Stand aside!" he exclaimed impatiently as he elbowed his way through the little crowd which had collected round the sledge. He propped up the little girl comfortably in the seat. She was so well wrapped round with coat and rugs that she could scarcely move. The Commissary observed that Petrushka was insufficiently clad for travelling by night in such cold weather. "You will need your heavy coat," he urged. "It is foolishness on your part not to wear it. Have you no fear of frost-bite?" "None whatever," answered the other with a smile. "I never feel the cold. Besides," he added in a whisper, "if there are really wolves on the road, I'll be all the more able to deal with them as I am." The Commissary shook his head doubtfully, but ere he could utter another word of warning the driver whipped up his horses. Petrushka shouted a cheery farewell as the sledge glided away. "The man is mad," growled a groom. "If we ever look upon him in life again I shall be greatly surprised." "May God protect the little girl!" muttered the Commissary, turning away. The sledge went skimming smoothly along the narrow highway, the horses' hoofs pattering with little sound on the snow and the bells tinkling merrily in the frosty air. Soon the driver began to drone an old song, and the horses twitched back their ears constantly as if the sound of his voice gave them pleasure. A yellow streak of evening light appeared in the western sky, and overhead the crescent of the new moon seemed to be a silver sledge racing across wastes of snowy clouds. "We are going to have a pleasant journey to Moscow, little Marya," Petrushka said. The girl smiled faintly. "I am very tired," was her answer. "But you are comfortable now, I am sure." "Yes, very. . . . Why don't you put on your thick fur coat? I really don't require it. The rugs will keep me quite warm." "And you are not a bit afraid either, eh?" "Not when you are beside me, Petrushka. The woman in the inn said we might be attacked by wolves. You will shoot them if they come, won't you?" "It was wrong of the woman to try and frighten you," Petrushka said with a frown. "Of course I shall shoot any wolves that dare to come near us. Have no fear of them. . . . Listen to the driver's song. The bells seem all to be ringing in tune." a princess who was once carried through the air in a golden car drawn by wild geese. She listened with delight as the sledge sped onward along the level highway. The story was a long one, and when Petrushka had finished it had grown dark. They were passing through a forest, and the gaunt leafless trees, laden with snow, stretched out their branches on either side like giant hands which were trying to clutch at passers-by. An icy wind began to blow out of the north, and tossed into the sledge the flakes of snow which were loosened by the horses' hoofs. Marya grew more afraid, and when she spoke her voice trembled. "Do you feel cold?" asked Petrushka softly. "No, I am not cold," the girl made answer, "but I am just a little afraid." "We shall soon leave the forest," the man assured her. "It comes to an end about two versts farther on." Petrushka's voice sounded hollow and strange in the darkness. From the trees came curious snapping noises as the wind rushed past them through spaces which had been cleared by peasants. A sense of loneliness pervaded the night. The driver had ceased to sing. Now and again he spoke to the horses, urging them to speed faster. narrow ribbon. Suddenly Marya uttered a faint scream. "What is wrong with your left ear?" she asked Petrushka. "It is terribly swollen." The man raised a hand and touched his ear. It seemed hard as a piece of wood. "Put on your thick fur coat," urged Marya. Petrushka laughed a forced laugh. "Oh! it is nothing," he said gaily. "One can cure a frost-bite very easily." As he spoke he gathered a handful of the snow which had collected in the sledge and rubbed it vigorously against his ear. "Snow is a certain cure for frost-bite," he told the girl. "Draw your veil down over your face. The cold wind may nip you as well." Marya did as he suggested. "Can't you cover your own face, too?" she asked. "Wrap this rug round your shoulders." Petrushka continued to rub the frost-bitten ear, until a shout from the driver caused him to leap to his feet. The horses were snorting excitedly, and the sledge rocked from side to side like a boat tossed by angry billows. "Keep the horses running straight ahead!" Petrushka called to the driver, who was scolding and taunting them as if they were rowdy children. "What is wrong?" asked Marya, leaning forward and clutching Petrushka's right arm. Ere he could answer, a piercing howl rose through the keen night air. "Wolves! wolves!" screamed the affrighted girl. "Hush! Do not be afraid," Petrushka said softly and firmly. "If you cry out like that, you is will only encourage them. I'll soon scare off the cowardly brutes. They are afraid of fire-arms." It was all the driver could do to keep control of his horses. The poor animals had been suddenly thrown into a state of alarm. On a little eminence at a bend of the road, about fifty yards in front of them, stood a great, long-legged wolf, sharply outlined against the snow, and howling fiercely. It was the scout of a hungry pack, which was scouring a forest near at hand in search of food. Petrushka and the driver realized that their only hope was to drive past this animal before its fellows came up and attacked in force. The horses reared and faltered, and despite the efforts of the driver ultimately came to a standstill, snorting and trembling with fear. Petrushka leapt from the sledge and ran forward towards the wolf. Then, kneeling in the snow, he took steady aim with his hand-gun and fired. The wolf was struck and fell over on the snow, yelping with pain. In another minute the horses were racing forward again. Petrushka leapt into the sledge when it reached him, and sat down beside Marya, who was sobbing with terror. along at a fine speed. We shall escape all danger." "Won't the other wolves follow us?" she asked faintly. "They will wait to devour the one I shot," answered Petrushka. "We shall thus gain time. The horses know now that the wolves are behind us. How splendidly they run!" The driver was sitting bolt upright on his seat, shouting lustily to encourage the horses. Marya, who had dried her eyes, was somewhat reassured by the coolness displayed by Petrushka. "Do you think the wolves have gone away?" she asked him as, kneeling on the seat, he peered anxiously over the back of the sledge. He turned round to answer her, but before he could speak an affrighted scream escaped her lips. "What is wrong with your nose?" she asked. Petrushka's nose was grotesquely swollen, and imparted to his face a fearsome aspect. "Frost-bite," he groaned, seizing another handful of snow and rubbing his nose vigorously. The driver glanced round. "God preserve us!" he shouted; "they are coming on now." Once again the horses had begun to show signs of alarm, and it was as much as he could do to keep them in control. through the night. The pack was following a new leader, in full chase after the sledge. Marya moaned fitfully, while the horses broke into a gallop which was sure to exhaust them sooner or later. The yelping and howling of the wolves sounded fiercer and louder as they drew near. Petrushka watched the dark forms growing larger and larger, and raised his gun to fire when they came within range. He took little thought for himself, although he realized that by neglecting the frost-bite he would probably be disfigured for life by loss of nose and ear. His sole concern was to protect Marya, who had been committed to his care. The little girl had swooned with terror, and lay back on the seat. Petrushka bent over her for a second, and adjusted a rug so as to enable her to breathe more freely. Then he seized his gun again. In another minute he fired, and then grasped a pistol and fired a second time. Two wolves rolled over in the snow, and the pack faltered to tear them to pieces and devour their flesh. Petrushka at once reloaded his fire-arms. Shout as he might, the driver was unable to control his horses. "Can't you keep them in hand?" shouted Petrushka. "The grey horse has gone quite mad," the driver answered, tugging the reins furiously. "He will upset the sledge at the first bridge." "Will I shoot him?" asked Petrushka. "It would delay them. Before they could devour the horse we might reach shelter. How far off is Moscow?" "Ten versts. But there is a village half that distance from here." Petrushka climbed over the sledge to the driver's seat. "We'll sacrifice the grey horse," he said, shouldering his gun and discharging it. The animal at once reared madly, and then fell heavily forward, bringing the other horse to a standstill. For a minute it seemed as if the sledge would be upset. But the driver saved the situation by causing the brown horse to swerve sharply. Then he leapt out, grasping the axe in his hand, and with a few deft blows cut the harness which attached the fallen animal to the sledge. Meanwhile Petrushka had run forward and was holding the brown horse by the head. Once again the howling of the wolves grew louder and nearer. There was no time to be lost. The driver sprang forward and backed the brown horse, until he was able to get the sledge slewed round and drawn past the grey, which was struggling convulsively in the snow. "Jump in!" he shouted to Petrushka. He clapped the brown horse on the neck, spoke to it softly, and then ran back to his seat. animal, cracking his whip excitedly. "We'll reach the village yet." 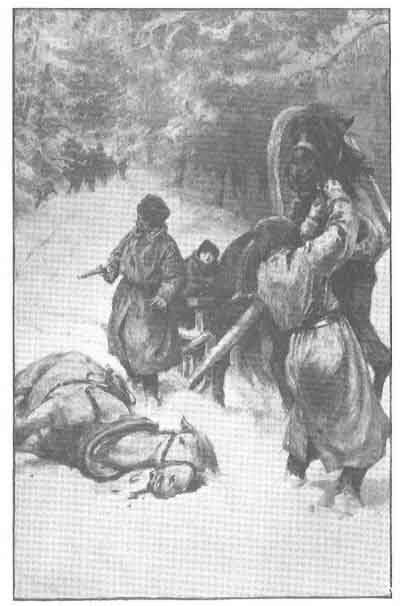 The horse darted forward just as Petrushka fired at the wolves with gun and pistols at close range. Three animals fell sprawling in the snow. "They won't trouble us now for a time," he shouted to the driver. "What a gorge we have left for them!" The driver made no answer. He kept cracking his whip and shouting to the brown horse, which ran steadily, but was already showing signs of exhaustion. Petrushka knelt beside Marya and rubbed snow on her white face. Soon she opened her eyes and sighed deeply. "Have the wolves gone away?" were her first words. "We have left them far behind," answered Petrushka. "Before long we shall reach a place of safety." The sledge went on smoothly for a time. Then the driver began to show signs of anxiety. "Ah, would you?" he shouted excitedly to the horse. "Get on! Lively there! If you tarry the wolves will get us." The brown horse was slowing up, panting heavily. "What a feed of corn is waiting for you!" the driver called to the horse. "Do you hear me?" He cracked his whip impatiently. "Let him walk a bit," Petrushka said, standing up behind the driver. "There is a bridge not far off," answered the driver, "and a verst beyond it is the village. When we cross the bridge I shall feel safe." The horse began to walk, with head drooping listlessly, and the driver turned round to speak to Petrushka. "You are badly frost-bitten," he said. "You will have good cause to remember this night's journey." The words had scarcely left his lips when the horse, scenting danger once again, broke into a sharp trot, with head erect and ears shifting uneasily. "They are coming now!" exclaimed the driver, tightening his hold on the reins. He knew full well the horse had scented the approaching pack. "What does the driver say?" Marya asked, as Petrushka clutched his gun and stood up on the seat. "Are the wolves still chasing us?" The man made no answer. But Marya was not long left in doubt as to what was happening. The shrill yelps of the bloodthirsty animals came up the wind, sounding fiercer and more awesome than before. "Now for the bridge!" shouted the driver to Petrushka. "Hold on!" that once the bridge was crossed the chances of escape would increase. "Steady! Steady!" bawled the driver excitedly, as the animal reached the hollow that lay between the level highway and the bridge. In another minute the sledge was tilting over like a listing boat, and seemed in danger of being upset. But it was righted as abruptly with a rough jolt, and then ran smoothly over the bridge. On the other side it plunged and rocked again, and almost came to a standstill. Petrushka leapt out, and running forward grasped the reins behind the horse's mouth, and led the snorting animal up the steep bank in safety. "Jump in!" exclaimed the driver impatiently. "You will need your fire-arms presently." "Give me the axe," Petrushka said. "I will keep the wolves back until you reach the village." "Are you mad?" shouted the other. "You will be torn to pieces in a few minutes if you wait there. Jump in!" The howling of the wolves sounded nearer at hand. "Give me the axe!" Petrushka repeated in a peremptory voice. "Then drive on as fast as possible and send help. I'll keep the brutes at bay. If I perish, convey Marya to Moscow. She has my purse, and will reward you generously." The driver threw the axe from the sledge and cracked his whip. "Farewell, Marya!" Petrushka shouted as the sledge skimmed past him. An affrighted scream was the only answer he received. "Do not be afraid, little one," shouted the driver without turning his head. "You will soon be safe in a comfortable inn." Petrushka climbed the parapet of the bridge to await the wolves. He had perceived that at this point the pack would be unable to cross the frozen river, because the banks were so steep and slippery, without making a wide detour. They must needs scamper over the bridge if they were to catch up the sledge before it reached the village. So he had made up his mind suddenly to hold them back until Marya's escape was assured, and to sacrifice his life for her sake if needs be. with pain. Other wolves which came up attacked it, maddened by the smell of blood, and ere long had stripped the flesh from its bones. Petrushka began to tremble, partly with excitement and partly because he was suffering from the effects of frost-bite. He dreaded that he would collapse before the sledge reached the village, so he cast aside his gun and seized his pistols. In another minute he fired twice in succession into the midst of the scrambling wolves. For a short interval it seemed as if the animals would be scared away. But ere he could reload his pistols a great grey wolf, leaping towards him, made a frantic effort to drag him down. Petrushka seized the axe and struck a fierce blow, which caused the animal to drop dead beneath him. But its attack had encouraged the others, and several rushed forward to close with him, snarling with bared teeth. A brief and desperate struggle followed. Petrushka was bold as a lion, but his strength was fast ebbing away, and when one of the animals succeeded in scrambling up the parapet and came bounding towards him, he swung his axe round to strike a blow, but overbalanced himself and fell with a crash on the frozen river beneath. But the brave Petrushka did not die in vain. The sledge reached the village before the terrible fight came to an end, and several men rushed out from the inn when they heard the harness bells jingling in the night air. "Have you seen wolves on the road?" one called to the driver as he drew near. "Yes, yes; and a man is keeping them back on the bridge," the driver answered, hoarse with excitement and horror, as he drew up his horse "Hasten to his aid! There is no time to be lost," he urged them. "Wolves, wolves!" cried the men in chorus, running towards the inn to obtain fire-arms, and let loose the hounds that were kept to scare wolves away. Ere many minutes had elapsed half a dozen brave fellows went scampering along the road towards the bridge, each armed with a brace of pistols. Several great hounds went barking loudly in front of them. Then two men mounted on horses galloped past the sledge. "Petrushka's life may yet be saved," the driver said soothingly to Marya as he lifted her out of the sledge and carried her into the inn. When the rescuers reached the bridge they found that the wolves had fled away, having scented danger. They at once made search for Petrushka, and at length discovered him lying dead on the surface of the frozen river. "God rest his soul!" an old man exclaimed piously. "He died to save others." "Look! look!" exclaimed another. "He has been badly frost-bitten. How dreadfully his face is swollen!" old man remarked. "But his last thoughts were not for himself. He sacrificed the little portion of life that remained for him so that the child might escape a dreadful death. Let us return, brother, taking the corpse of this good man with us." The fate of Petrushka was hidden from Marya until the morning. She wept copiously when she was informed of his death. The women at the inn did their utmost to comfort her, and one of them accompanied her to Moscow, where she was delivered safely into the arms of her mother. The driver was rewarded liberally for his services. 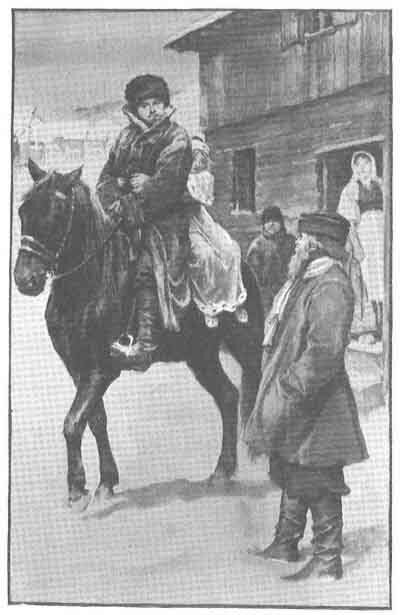 Two days later Mrs. Gordon and her girls crossed the frontier into Poland, and were conveyed to a village where the General awaited their arrival. The war-worn soldier embraced each one affectionately. Then he asked, "But where is Petrushka?" Marya related all that had taken place. "He was faithful unto death!" exclaimed General Gordon, with tears in his eyes. "A braver man never died on a battlefield. He sacrificed himself doing his duty, like a true Russian and a true Christian."